AVAILABLE FOR QUICK POSSESSION - TURNKEY READY! COMMUNITY: Viewpoint Golf Resort offers a Player Friendly” 18-hole (71 Par) Championship Course and a 9-hole Executive Course for Golfers of All Abilities. With over 75,000 SQ' of Recreational Space, this Amazing Active Age Qualified Community also offers a State-of-the-art Fitness Facility, Four Heated Pools, Whirlpool Spas, Tennis Course, Billiards, Shuffleboard, Banquet Room, Horseshoe Pits, Huge Ballroom, Crafts, Classes, Woodworking, Glass-making, Live Concerts and Too Much More to List. Enjoy Happy Hour and Delicious Food at the On-Site Restaurant Overlooking Golf Course, this Amazing Community also offers RV Storage and a Hair Salon. Close to Dozens of Restaurants, Shopping, Banking and Medical Facilities, and Just Minutes from the Loop 202 and US HWY60. UPGRADES/OPTIONS: Shingled Roof, 14' Wide Front Composite Deck, Double Sinks/Base Drawers & Tub/Shower Combination, Large MBR w/Queen Bedroom Suite, Front LR and DR, Tons of Storage Throughout. Large Covered Carport Doubles as Outside Patio w/Additional Pavers & Custom Built-in Gas BBQ and Matching/Connected Utility Room w/Full Size Washer & Dryer and 2nd ½ BA. FEATURES/BENEFITS: Light and Bright Open Concept Floor plan w/Convenient Center U-KIT, Breakfast Bar, Appliances and Furnishings (Dishes, Cutlery, Glasses, Pots & Pans and Small Electric Appliances). Ample Storage Throughout Including; Built-in Hall Coat Closet, Pantry Cabinet, Plus Built-in Linen Cabinets in Bathroom. Turnkey Ready w/Queen Size Sofa & Loveseat, Linens, Coffee and Side Tables, Lamps, Flat Screen TV (and Stand), Dining Room Table, Wine Fridge & Built-in Spice Racks, Queen Bedroom Suite w/Additional Wall Mounted Flat screen, Patio Furniture & Workbench. OTHER: Lots of Extras Including Exterior Rope Lighting & Speakers, Additional Exterior Storage Cabinet, Front and Rear Door Screens, Bar Fridge, Gas Fire-pit, Exterior Flat Screen TV, Roll-down UV Sunscreens, Heat Pump, Water Softener, Ceiling Fans w/Lights T/O, UV Screens on All West Side Windows, Men's & Ladies Bikes and Stand, Electric Water Fountain, Blue Tooth Stereo and Extra Speakers. COMMUNITY: Located in Beautiful, Age Qualified, and Gated Golf Resort Community in Mesa: Featuring Ground set Doublewides, Convenient Located within Minutes of more Golf, Shopping, Restaurants, Medical Facilities and Much More! Amenities Include; 9-Hole Pitch and Putt Par 3 Golf Course, Heated Pool, Whirlpool/Spa, Clubhouse, Exercise Room, Game Room, RV Storage, Friendly Neighbors Waiting for You! POPULAR FEATURES: Convenient Walk-Through Kitchen, Pantry Closet, Front LR/DR w/Built-in Buffet, Linen Closet, Large MBR w/Sliding Wardrobe. Includes Furniture and Furnishings Incl. ; Queen Size Bed, Night Stands, Dresser and 2nd BR with Sofa Sleeper, and Computer Desk, Sofa and Love Seat Recliners, End Tables, Coffee Table, (2) Flat Screen TV's, Book Case, Dinette and Chairs, Silverware, Dishes, Patio Furniture and Too Much More to List. Large Screen Room Offers Indoor/Outdoor Carpet w/Front and Rear Access from Home, Front and Rear Exit to Fruit Trees & Rear Covered Patio. OTHER: Light and Bright with a Southern Front Exposure, Huge Corner Lot, Vinyl Siding, Easy Upkeep Landscaping, Lemon, Orange and Lime Citrus Trees and Friendly Neighbors. 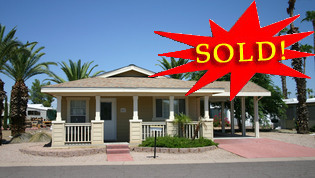 Occupancy Negotiable and Priced to SELL! UPGRADES/OPTIONS: Shingled Roof, Dual Pane White Vinyl Framed West Facing Windows (Light Tint), Custom Front Perimeter Decorative Stone Facing, Huge 12' X 28' Golf Course Facing Rear Composite Deck and Patio Cover (LR & KIT Access), Double Sinks/Base Drawers & Custom Tile Walk-in Shower in Double Entry Access MBA, ¾ Guest BA w/Granite Vanity, and Granite Vanity. Name Brand Upgraded Appliances Including DD/FF Refrigerator (Water & Ice), 30” Smooth Top Range, Over-Counter Microwave/Convection Oven, Dishwasher Plus Full Capacity Front Load Stacked Washer & Dryer (Steamer Feature). Double In-Line Carport with Epoxy Coated Concrete and Gracious Finished Double Door Utility Room Doubling as a Golf Cart Garage. FEATURES/BENEFITS: Open Concept Floor-plan, Functional Eat-in U-KIT w/Breakfast Bar, Ample Storage Throughout Including Mirrored Wardrobe Entry Coat Closet, 42” Kitchen Cabinets w/Pull Out Drawers & Adjustable Shelving, Built-in Linen Cabinets, Utility Room Base & Overhead Storage Cabinets, Additional Exterior Side Storage Shed and Storage Bin. Turnkey Ready w/Front LR Murphy Bed & Electric Fireplace, Space Saving Armoire/Office Center, King Size Bedroom Suite, Wall Hangings, Deluxe Patio Furniture, Gas BBQ, (2) Flat Screen TV's, Linens and a Fully Stocked Kitchen. OTHER: Rear Side Pavers & Storage Cabinet, (3) Ton Heat Pump, Updated Water Heater, Offside Rain Gutters, Sunscreens, Ceiling Fans w/Lights T/O, Wall Mounted Speakers, Patio Flat Screen TV Bracket, Plus an Orange Tree. Pets Okay, Available for Possession May 1, 2019. UPGRADES/OPTIONS: Located on Large Corner Lot - Just Two Blocks Away from State-of-the Art Cabana-Pool-Fitness Facility. All Electric w/ Central AC & Heat (Heat Pump) w/ Smart Thermostat, Tape & Textured Walls, Shingled Roof, Dual Pane Windows (Light Tint), Extended Front Blocked Porch w/ Railing, Low Upkeep Landscaping, Double Door - Utility Room/Golf Cart Garage, Epoxy Driveway and Perimeter , Walk-in Closets in Master and 2nd Bedroom. FEATURES/BENEFITS: Gorgeous Wooden 42” Cabinetry w/Raised Panel Doors & Adjustable Shelves, Formica Counter-Tops (Rounded Edges), Built-in Pantry, Linen Cabinets and Hall Cabinets. Includes Upgraded LG Stainless Steel Appliances: French Door/Base Freezer Refrigerator, 30” Smooth Top Range, Space-Maker Microwave & Dishwasher. Lots of Storage Throughout Including Built-in Storage Cabinets, Pantry, Linen, MBA Vanity w/Base Drawers and Built-in Storage Cabinets in Separate Laundry Room. OTHER: Build-out Opportunity on West Facing Corner Lot, Superior CAVCO Construction and Craftsmanship, 2' X 4' Exterior Walls (16” Centers), 2' X 6' Floor Joists (16” Centers), 90” Sidewall Height, Solid Steel I-Beam Frame Construction & Hardboard Siding. Pets Okay. UPGRADES/OPTIONS: This Spacious Home Offers Massive Living Area, Central & Heat and is Ready for Quick Possession. New Owners will Enjoy the Multitude of Updates and Upgrades Including; Laminate Floor Covering in Both Dining Rooms & Kitchen ($2000 Value), Deluxe Plush Carpet, White Kitchen Cabinets, Updated Exterior Paint ($2000 Value), Professional Window Tint ($600 Value), Updated Sunscreens ($600 Value), Updated Tub Surrounds & Countertop in Bathrooms, Updated Garbage Disposal, Vertical Blinds in LR/DR/AZRM ($500 Value), and Updated Interior Multi-tone Paint. POPULAR FEATURES: Formica Kitchen Counter-tops, Deep Ceramic Sink w/SL Faucet, Walk-Through Bath Access from Hall and 2nd BR, Separate Laundry Area in MBR Dressing Area. Also Features Fully Equipped Wet Bar, (2) Dining Areas. Built-in Office/Computer Desk Area, Coat Closet, Built-in Linen in MBA, Extended Vanity in Both Baths, Additional Vanity in MBA Dressing Area. Full Length Arizona Room Offers Even More Living Space Plus and Additional Private Inside Storage Area/Office for Ample Entertaining/Guest Accommodations. OTHER: This Home Comes Partially Furnished. Updated Appliances Include; Magic Chef FF Fridge (2011), Frigidaire DW (2011), Frigidaire Gas Range (2011) and Full Size Washer & Dryer. This Home Offers Massive Storage Space throughout Including; Sliding Wardrobe Closets, Coat Closet, Portable Pantry, Built-in China Hutch and a Large Wired Workshop/Utility Room. Larger Pets OK! UPGRADES/OPTIONS: Over $20,000 in Upgrades and Remodeling SINCE 2016 Including; NEW FURNACE, NEW SUB-FLOOR AND LAMINATE FLOOR COVERING ($6000 VALUE), RE-PLUMBING ($1700 VALUE), HARDWOOD KITCHEN CABINETRY, NEW COUNTERTOPS, NEW JENN AIR EYE LEVEL RANGE, GAS COOKTOP, GARBAGE DISPOSAL, DISHWASHER AND REFRIGERATOR. POPULAR FEATURES: Spectacular Kitchen Remodel also Features Custom Backsplash and Window Covering and Newly Installed Buffet in Dining Room Plus Built-in MBR Cabinets (Currently Used as Office Area. MBA Features Garden Tub, Built-in Linen, Extended Simulated Marble Lavvy and a Walk-in Shower. 2nd BA Features New Base Vanity, New Commode and a One-pc Tub/Shower Combination. OTHER: Rear Patio Area has Been Created with a 6ft Vinyl Privacy Wall (Partially Enclosed), Full Length Covered Patio and Double In-Line Carport Plus a Large Matching and Connected Storage Shed. Includes All Appliances, Some Furniture/Furnishings Negotiable. Pets Okay. UPGRADES/OPTIONS: Two Blocks Away from State-of-the Art Cabana-Pool-Fitness Facility. All Electric w/ Central AC & Heat (Heat Pump), Tape & Textured Walls, Shingled Roof, Dual Pane Windows (Light Tint), White Plantation Shutters Throughout ($3200 VALUE), Custom Travertine Front & Rear Pavers ($3000 VALUE) Extended Front and Rear (Covered) Patios & Decorative Entry Gate ($7400 VALUE), Remote Controlled Roll-up Sun Shades ($4400 VALUE), ECO- Water Treatment and Reverse Osmosis System ($5100 VALUE), TruTankless Water Heater ($4100 VALUE), Underground Irrigation Systems w/Electronic Timer ($500 VALUE), Double Door Wired Utility Room ($3,500 Value), (2) Additional Storage Sheds ($2400 VALUE), Skid-Resistant Epoxy Driveway ($1700 VALUE), Classy Closets Upgrade ($3000 VALUE), Upgraded Name Brand Kitchen Appliances Including Stainless Steel Dishwasher, Side-by-side Refrigerator (Water & Ice), Over Counter Microwave and Smooth-top Range ($4000 VALUE). FEATURES/BENEFITS: Gorgeous Open Concept Pebble Beach Floor Plan is Stunning w/(2) Tone Interior Paint, NEW Waterproof Laminate Floor Covering ($6000 VALUE), White Wooden 42” Cabinetry & Doors and Remodeled Guest Bath w/Granite Counter and Melamine Base Cabinets ($3000 VALUE) and Tub/Shower Combination with Dual Showerheads. MBA has Double Sinks, Walk-in Shower and Built-in Linen Cabinets. Generous Storage Throughout Including MBR Custom Walk-in Closet (Classy Closets), 2nd Bedroom Makes Perfect Office/Craft-Reading Room/Lounge with Custom Closet (Classy Closets). Large Master Bedroom Easily Fits King Bedroom Suite (3rd Bedroom Accommodates Queen). Separate Laundry Room Exits to Double In-Line Carport and Also has Classy Closet Upgraded Storage Cabinets. OTHER: Superior CAVCO Constructions, 2' X 4' Exterior Walls (16” Centers), 2' X 6' Floor Joists (16” Centers), 90” Sidewall Height, Solid Steel I-Beam Frame Construction & Hardboard Siding. Home offers Additional Exterior Electrical Outlet is Conveniently Placed next to Golf Cart Parking, (3) Exterior Water Spickets Plus an Abundance of Mature Trees/Plants Including; Meyer Lemon, Orange and Pomegranate Trees along with Honeysuckle, Feather Duster, Palm and Oleander. Available for Immediate Possession and Pets Okay! UPGRADES/OPTIONS: Two Blocks Away from State-of-the Art Cabana-Pool-Fitness Facility. All Electric w/ Central AC & Heat (Heat Pump), Tape & Textured Walls, Shingled Roof, Dual Pane Windows (Light Tint), New Bali Layered Window Shades ($1500 Value), Custom Front Extended Blocked Porch w/ Baked Enamel Railing & Exterior Entry Gate ($4,200 VALUE), Extended Side Paver and Boxed Steel Upright Driveway ($2400 VALUE), ECO- Water Softener, Reverse Osmosis & Automatic Drip System ($4000 VALUE), Double Door Utility Room ($3,500 Value), Skid-Resistant Epoxy Driveway & Patio ($3000 VALUE), Extended Private Rear Patio w/Retaining Wall, Entertainment Bar, Exterior Wall Mounted Flat screen and Retractable Sun/Wind Shades, Additional Rear Storage Shed and Mature Landscaping ($3500 VALUE), Upgraded Stainless Steel Kitchen Appliances (French-Door Refrigerator w/Bottom Freezer, Convection Microwave, Dishwasher and Smooth Top Range ($3700 Value). Separate Laundry Room Features Full size Samsung Washer & Dryer ($1000 Value), Overhead Storage Cabinets ($300 VALUE) and Summer/Winter Glass & Screen Door ($350 VALUE). FEATURES/BENEFITS: Gorgeous Wooden 42” Cabinetry w/Raised Panel Doors & Adjustable Shelves, Formica Counter-Tops (Rounded Edges), Eat-in Kitchen w/Electric Center Island/Breakfast Bar, and Front Dining Room Bay w/Access to Front Patio w/Summer/Winter Screen & Glass Patio Door ($350 VALUE). MBA Features Executive Height Double Sink Vanity w/Base Drawers, Custom Glass Mosaic Mirror Frame, Built-in Linen Cabinets, Private Commode and Walk-in Shower w/Double Seats (Tub/Shower in 2nd BA). Generous Storage Throughout Including MBR Walk-in Closet, Pantry Closet, Built-in Hall Cabinets, Sliding Wardrobe Closets in 2nd & 3rd Bedrooms and Exterior Sunscreens ($1000 VALUE). OTHER: Superior CAVCO Constructions, 2' X 4' Exterior Walls (16” Centers), 2' X 6' Floor Joists (16” Centers), 90” Sidewall Height, Solid Steel I-Beam Frame Construction & Hardboard Siding. Additional Exterior Electrical Outlet, (2) Exterior Water Spickets, Custom Accent Paining, Transferrable Heat Pump Service Warranty Until 2023, Meticulously Maintained, Most Furniture & Golf Cart Negotiable, Available for Quick Possession and Pets Okay! QUICK POSSESSION - CLOSE TO POOL/CABANA/FITNESS CENTER & GOLF! UPGRADES/OPTIONS: Two Blocks Away from State-of-the Art Cabana-Pool-Fitness Facility. All Electric w/ Central AC & Heat (Heat Pump), Tape & Textured Walls, KIT/LR/DR White Wooden Window Shutters ($4,000 Value), Shingled Roof, Dual Pane Windows (Light Tint), Sunscreens, Custom Front Blocked Porch w/ Exterior Entry Gate ($4,200), Custom Side Planter with (4) Dwarf Lemon, Orange, Tangelo & Lime Citrus Trees ($900 Value), Automatic Drip System, Low Upkeep Landscaping, Double Door Tape & Textured Utility Room ($4,500 Value) (Wall AC), Extended Carport w/Boxed Steel Uprights and Custom Side and Rear Pavers and Extended Box Steel Uprights ($2,600 Value) Plus and Epoxy Driveway ($2200 Value). FEATURES/BENEFITS: Gorgeous Wooden 42” Cabinetry w/Raised Panel Doors & Adjustable Shelves, Formica Counter-Tops (Rounded Edges), Eat-in Kitchen w/Electric Center Island/Breakfast Bar, and Front Dining Room Bay for w/Access to Front Patio (Retractable Screen Door). MBA Features Upgraded Double Sink Vanity w/Base Drawers, Built-in Linen Cabinets, Private Commode and Walk-in Shower w/Double Seats. Massive Linen Cabinets in 2nd BA w/Tub/Shower Combination - Convenient to 2nd BR. Includes Appliances: Upgraded Kenmore/Elite Black Stainless Steel Appliances, 30” Smooth Top Range (Double Oven), Space Maker Microwave, Dishwasher ($5,500 Total Value). Separate Laundry Room Includes Full Size Washer & Dryer and Offers Ample Built-in Storage. OTHER: Walk-in Closet (MBR), Pantry Area w/Sliding Drawers, Custom Roll Down Carport Sunshades ($2,800 Value), Updated KIT/BA Faucets ($300 Value) and Ceiling Fans Throughout. Superior CAVCO Construction and Craftsmanship, 2' X 4' Exterior Walls (16” Centers), 2' X 6' Floor Joists (16” Centers), 90” Sidewall Height, Solid Steel I-Beam Frame Construction & Hardboard Siding. PRICE JUST REDUCED TO $149,700! UPGRADES/OPTIONS: Located on 4th Hole of (9) Hole GOLF COURSE and Close to State-of-the Art Cabana-Pool-Fitness Facility. 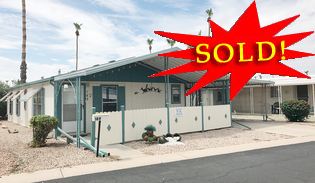 All Electric w/ Central AC & Heat (Heat Pump), Tape & Textured Walls, Shingled Roof, Dual Pane Windows w/Factory Tint, Custom Front and Rear Blocked Porch, Easy Upkeep Desert Landscaping w/Front Drip System, Cacti and Planters ($8100 VALUE) and Epoxy Coated Driveway ($1400 VALUE) . Other Upgrades Include Remote Controlled Roll Down Privacy Louvered Sun Shades ($7000 VALUE), Custom Adjustable Cloth Window Shades Throughout ($6600 VALUE), Deluxe LG Smart Stainless Steel Appliances Incl. (5) Burner Smooth Top Range, Over-Counter Microwave/Convection Oven, French Door/Base Freezer Refrigerator (Temperature Control) and Whirlpool Front Load Washer & Dryer ($5900 VALUE). FEATURES/BENEFITS: Gorgeous “RYE” 42” Cabinetry w/Adjustable Shelves, Formica Counter-Tops (Rounded Edges), Electric Center Island, Built-in Computer Desk, Large Front and Rear Living Area w/Additional Air Vents ($700 VALUE), Separate Laundry Room, 2nd BA Tub/Shower Combination and Double Sinks and Private Commode in MBA W/Double Seated Walk-in Shower (Comfort Height Commodes in Both Bathrooms - $435 VALUE). Other Benefits Include: Golf Ball Protective Sunscreens ($1100 VALUE), Water Softener and Reverse Osmosis ($1600 VALUE), Upgraded Carpet Pad ($1025 VALUE) Package, Custom Closets in MBR and Laundry Room ($1500 VALUE), PLUS Upgraded Interior Paint (to Satin/Two Tone) Interior and Real Wood 42” Cabinet Fronts ($1900 VALUE). OTHER: Massive Built-in Storage Throughout, Most Furniture, Furnishings and Golf Cart are Negotiable. Superior CAVCO Construction and Craftsmanship, 2' X 4' Exterior Walls (16” Centers), 2' X 6' Floor Joists (16” Centers), 90” Sidewall Height, Solid Steel I-Beam Frame Construction & Hardboard Siding. Quick Possession! COMMUNITY: Located in Beautiful, Age Qualified, Gated Golf Resort Community in Mesa: Featuring Ground set Doublewides, Convenient Located within Minutes of more Golf, Shopping, Restaurants, Medical Facilities and Much More. Amenities Include; 9-Hole Pitch and Putt Par 3 Golf Course, Heated Pool, Whirlpool/Spa, Clubhouse, Exercise Room, Game Room, RV Storage, Friendly Neighbors Waiting for You! UPGRADES AND OPTIONS: This Adorable over 1500 SQ' Home Offers (2) Spacious Bedrooms, MBA Walk-in Shower and Separate Dressing Area with Sliding Mirrored Wardrobe and Walk-in Closet, 2nd BA Full Tub/Shower, Walk-Through Kitchen w/Updated Appliances (Eye Level Range, Side by Side Refrigerator & Dishwasher). Seller has Recently had Gutters Cleaned and Down Spouts Installed, Heavy-Duty Screen (Screen Room), New Roof Coat and Updated the AC in 2016. POPULAR FEATURES: Large Living Room Plus Additional Den/TV Area, Tons of Built-in Cabinets and Drawers, Formal Dining Room w/Hutch, Vertical Blinds, Front Picture Windows, Light Interior Walls, Ceiling Fans, Separate Laundry Area w/Full Size Washer & Dryer. 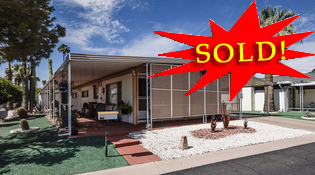 Double In-Line Carport has Privacy Panels w/Matching & Connected Wired Workshop/Storage Shed. OTHER: Available Mostly Furnished (Including Heat Emitting Electric Fireplace, Gas Inventory List Upon Request - Gas Furnace and Water Heater - Pets Okay! UPGRADES/OPTIONS: Walking Distance From Clubhouse/Pool Area, Regularly Serviced Heat Pump (Semi-Annually), Partially Enclosed Fence, and Price Includes New 30 Gallon Water Heater. Includes Original Name Brand Kitchen Appliances: Maytag Refrigerator, GE 30' Range, Updated Garbage Disposal, and Amana Dishwasher. Recent Upgrades Include Carport Privacy Sunscreens ($1400 Value), Partially Enclosed Rear Privacy Fencing and Partial (East and South Walls) Exterior Paint. POPULAR FEATURES: Tape & Textured Walls, Cathedral Ceiling, Dual Pane Windows, Hardboard Siding, Shingled Roof and “Solar Panel” Insulated (Portion of) Carport. Massive Storage Throughout Including; Double Pantry Cabinets, KIT Island Base Storage Cabinets, (2) Large MBA Linen Closets, Built-in and Overhead Storage in Laundry Room, MBR Walk-In Closet Plus a 10' X 12' Matching/Connected Shed/Workshop. MBA also Features a Private Commode, Double Sinks and Walk-in Shower w/Double Seats. OTHER: Generous Bedroom Sizes Incl; Huge MBR (16' 7” X 12'8”), Large Front 2nd (11' 4” X 12'8”) and Middle 3rd (11' 8” X 12' 8”) Bedrooms, Split Front and Rear Bedrooms for Privacy and Easy Access 2nd BA with Full Tub/Shower Combination. UPGRADES/OPTIONS: UPGRADED FLOOR COVERING (CARPET & VINYL), UPDATED CENTRAL AC & HEAT (HEAT PUMP - 2014), UPDATED WATER HEATER (2018), UPGRADED KITCHEN APPLIANCES INCLUDING: DISHWASHER, MAYTAG REFRIGERATOR, DISHWASHER PLUS RECENTLY PURCHASED FULL SIZE WASHER & DRYER - 2018. Other Updates Include; Replaced MBA Vanity and Plumbing Fixtures, Kitchen Tile Countertops, Shut-off Valves under KIT sink, Ceiling Fans in KIT/DR/LR & MBR, Sunscreens, Tape & Textured Walls and a Shingled Roof. POPULAR FEATURES: Ground-set Doublewide with Front Covered Patio and Carport Covered Patio Enclosure, Double In-Line Parking this Open Concept Floor Plan has Large LR and Formal Dining Room with a Rear Eat-in Kitchen. This Gracious Split Floor Plan Features a Large Rear MBR with Walk-in Closet & MBA w/Walk-in Shower w/Double Seats. Also Features an Elegant French-door Entry to 2nd Bedroom w/2nd Walk-in Closet Plus Jack & Jill 2nd BA (Also accessible from Hall) & Full Size Tub/Shower Combination. North/South Exposure, this home is Light and Bright with Neutral Floor Covering and updated multi-tone Interior Paint. Separate Laundry Room Leads to Enclosed Patio Area and Offers Doggy-door Access. Generous Storage Throughout Including: Built-in (6) Door Kitchen Pantry, Hall Linen Closet, Additional Hall Storage Shelving, (2) Walk-in Closets Plus a Matching/Connected Storage Shed. OTHER: Available Furnished Including All Appliances, Sofa & Love Seat, End Tables, Coffee Table, Lamps, Wooden Buffet, Wall Mounted Flat Screen, Dining Room Table w/ (4) Chairs, Eat-in Kitchen Table & Chairs, Hall Occasional Table/Tree, China Cabinet, King Size Bed, Box Spring and Mattress, Dresser & Chest, Plus 2nd Bedroom Desk and Cabinets (inventory List Upon Request). Close to Golf Course, Community Center w/Heated Pool, Hot Tub and Fitness Center. 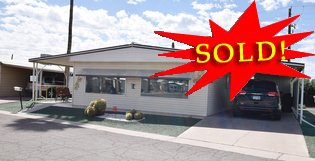 Seller is freaking out because the property has not sold yet even though the majority of the winter visitor traffic is not back yet and her pre-paid lot rent is paid until March 1, 2019. I told her I still think that 99,900 is a competitive list price but she wants it off her mind so her loss is a buyer's gain. NOW VACANT AND READY FOR IMMEDIATE POSSESSION! INCLUDES ALL APPLIANCES & PREPAID RENT UNTIL MARCH 2019 PETS OK! UPGRADES/OPTIONS: Located on Large Corner Lot - Just Two Blocks Away from State-of-the Art Cabana-Pool-Fitness Facility. All Electric w/ Central AC & Heat (Heat Pump), Tape & Textured Walls, Shingled Roof, Dual Pane Windows (Light Tint), Custom Front Blocked Porch w/ Railing and (2) Entry Gates, Low Upkeep Landscaping, Double Door Golf Cart Garage/Storage Shed w/ Shelving, Security Door, Blocked Golf Cart Driveway, Block Side Walkway, Walk-in Closet (MBR), Upgraded Ceiling Fans T/O. 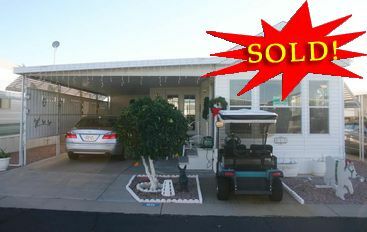 Golf Cart Conveys with Home Purchase. FEATURES/BENEFITS: Gorgeous Wooden 42” Cabinetry w/Raised Panel Doors & Adjustable Shelves, Formica Counter-Tops (Rounded Edges), Electric Center Island and Front Dining Room Bay for Eat-in Kitchen. MBA Features Private Commode and Walk-in Shower w/Double Seats, 2nd BA has Tub/Shower Combination Plus Massive Built-in Linen Cabinets. Includes Appliances: Upgraded Frigidaire Side-By-Side Refrigerator, 30” Smooth Top Range, Space Maker Microwave, Dishwasher and Full Size Front Load Washer & Dryer. Living Room and Patio Furniture Including: Sofa and Easy Chair, TV Stand, Flat Screen TV, Side Tables, Credenza in MBR, and Golf Cart. OTHER: Superior CAVCO Construction and Craftsmanship, 2' X 4' Exterior Walls (16” Centers), 2' X 6' Floor Joists (16” Centers), 90” Sidewall Height, Solid Steel I-Beam Frame Construction & Hardboard Siding. THE HIGHLANDS AT BRENTWOOD - BE SURE TO WATCH THE VIDEO! UPGRADES/OPTIONS: Well Loved Home (same owner for over 18 Years) has THOUSANDS in Upgrades INCL; NEWER CENTRAL AC/HEAT UNIT UPDATED PLUMBING (AND DRAINS), ROMODELED KITCHEN (NEW RAISED PANEL KITCHEN CABINETRY), NAME BRAND APPLIANCES INCL; FRIGIDAIRE REFRIGERATOR (2011), MAYTAG DW (2004) PLUS KENMORE WASHER & DRYER (20 YEARS OLD) AND GARBAGE DISPOSAL (2016). Other Upgrades Include Recently Recoated Roof (2015), NEW WATER HEATER (2018), Cloth Pull Down Blinds in MBR & MBA, NEW EXTERIOR PAINT, GUTTERS AND DOWNSPOUTS, NEW KITCHEN PLUMBING FIXTURES, HIGH RISE COMMODES IN BOTH BATHROOMS PLUS WATER SOFTENER. POPULAR FEATURES: Lots of Natural Light in LR with Three Large Front Picture Windows, Light Interior Walls. Front Entrance From Front Covered Patio to Huge FULL LENGTH ARIZONA ROOM W/VERTICAL BLINDS PLUS REAR OFFICE/CRAFT AREA, FRONT DINING ROOM, Walk Through Kitchen and Additional Family Room Plus Built-in Computer Area. Large Bedrooms Both w/Mirrored Wardrobe Closets, Formal DR with Built-in China Hutch, Faux Brick Feature Wall and Wet Bar (Could Convert to Large Pantry), Window Awnings, Double In-Line Carport with Privacy Screens, Separate Laundry Room w/Overhead and Side Storage Cabinets. Large MBA with Simulated Marble Double Sink Vanity, Base Drawers and Built-in Linen, 2nd BA w/Shower with Extended Vanity and Built-in Linen. OTHER: Friendly Neighbors, Close to Pool/Golf Course Community Center, Faces North! AVAILABLE FULLY FURNISHED INCLUDING (INVENTORY LIST UON REQUEST. UPGRADES AND OPTIONS: Updated Heat Pump, Water Heater, Water Softener, Shingled Roof, Enclosed Screen Room, Large Storage Shed, Painted Covered Patio and Double In-Line Carport w/Privacy Panels. 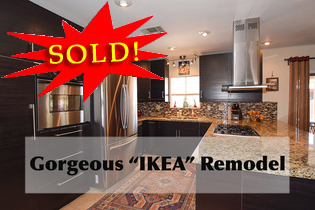 Available Fully Furnished including Most Furniture, Furnishings, All Appliances (AS-Seen - Inventory List Upon Request). POPULAR FEATURES: Open and Spacious Floor-plan w/Front Family/TV Room Plus Center Formal Living Room, Formal Dining Room and Front Kitchen w/Eat-in Breakfast Nook. Light and Bright w/Cathedral Ceilings, Mostly Tape & Textured Walls T/O, Spacious Master Bedroom w/Double Walk-in Closets and French Door Entry to MBA Featuring Walk-in Double Seat Shower and Built-in Linen Cabinets. Large 2nd Bedroom w/Mirrored Wardrobe and Smaller 3rd Bedroom (Perfect for Office/Craft Room), Large Utility Room w/Built-in Desk, (2) Closets, Overhead Cabinets and Full Size Washer & Dryer (Carport/Hall Access). OTHER: Well Maintained, Gutters & Downspouts, Rear Orange & Lemon Trees, Close to Community Center/Pool and Golf Course. Pets Okay! COMMUNITY: Gated Golf Community Conveniently Located within Minutes of more Golf, Shopping, Restaurants, Medical Facilities and Much More! Amenities Include; 9-Hole Pitch and Putt Par 3 Golf Course, Heated Pool, Whirlpool/Spa, Clubhouse, Exercise Room, Game & Crafts Rooms, RV Storage, Friendly Neighbors Waiting for You! OPTIONS/UPGRADES Updated Laminate Flooring Covering in LR/DR/Hall, New Carpet in BR, Knotty Pine Refinished Interior Walls, Updated Kitchen (Sink/Fixtures & Counter Top), NEW AC AND GAS FURNACE (2011), Ceiling Fans, Front Covered Patio Sunscreens, Huge Rear Blocked Patio, Full Length Covered Patio, Double In-Line Carport, NEW ROOF (2010), Exterior Lighting and Electrical Outlets, Updated Gutters, Uprights and Downspouts (Carport & Rear). FEATURES/BENEFITS: Cozy and Quaint Just Steps from Golf Course & Community Center with Fitness Room, Heated Pool, Hot Tub, Clubhouse and Shuffleboard. Ample Storage Throughout Including Coat Closet, Built-in Linen Cabinets/Shelving in Both Bathrooms, Large MBR Walk-in Closet, 2nd Bedroom Wardrobe w/Base Drawers, China Hutch, MBA Extended Vanity w/Base Drawers (Walk-in Shower) and 2nd BA w/Tub/Shower Combination. Separate Laundry Room Fits Full Size Washer & Dryer (Overhead Shelving) and Exits to Covered Carport w/Rear Extended Patio Carport and Large Storage Shed. OTHER: Faux Wood and Vertical Blinds, Decorator Window Treatments, Custom Tile Backsplash, Two Toned Interior Paint, Refinished Kitchen Cabinets and Easy Upkeep Landscaping. Includes Updated Name Brand Kitchen Appliances; 30” Gas Range, DD/FF Refrigerator, Dishwasher. Some Furniture & Furnishings Negotiable. *Per Community Guidelines. UPGRADES/OPTIONS: Located on Premium Corner Lot (Completed Phase 3) Resting Just Two Blocks Away from State-of-the Art Cabana-Pool-Fitness Facility. All Electric w/ Central AC & Heat (Heat Pump) w/ Smart Thermostat, Tape & Textured Walls, Shingled Roof, Dual Pane Windows (Light Tint),Wrap Around Porch w/ Railing, Low Upkeep Landscaping, 8' x 12' Storage Shed/Golf Cart Garage, Walk-in Closets (Both MBR and 2nd BR), Laundry Room w/ Maytag Washer & Dryer. FEATURES/BENEFITS: Gorgeous Light Oak 42” Cabinetry w/Raised Panel Doors & Adjustable Shelves, Formica Counter-Tops (Rounded Edges), Built-in Pantry, Linen Cabinets and Hall Cabinets. Includes GE Appliances: Refrigerator, 30” Smooth Top Range, Space Maker Microwave, and Dishwasher. Move-in Ready with Most Furniture Including: Sofa and Easy Chair, TV Stand, Dinette, Queen Bedroom Suite (Flat Screen in MBR) Trundle Bed in 2nd BR, Patio Furniture and 2006 Golf Cart (Recently Replaced Batteries). COMMUNITY: La Casa Trails Features Beautiful Panoramic Views of the Superstition Mountains, Quiet Surroundings, Swimming Pool/Jacuzzi, and Multi-Function Rec. Facility, Convenient Location within Walking Distance to Shopping, Restaurants, Medical Facilities and Much More. UPGRADES/OPTIONS: All Electric w/ Central AC (10 Years Old and Serviced Semi - Annually) and Furnace, Light Interior Walls w/Fun Bedroom/Bathroom Colors, Laminate Floor Covering LR/DR/KIT/HALL/HIGH TRAFFIC AREAS (New Carpet in Both Bedrooms) Plus a Remodeled MBA/2nd BA Vanities (Comfort Height Commode in MBA) and Faux wood Blinds (DR/LR). Exterior Upgrades Include NEW Exterior Paint (Feb/2018), Foam Roof Coat (Dec/2017), Sunscreens, and Rear Blocked Sun Patio. 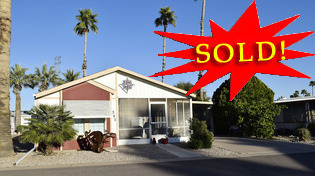 FEATURES/BENEFITS: Matching/Connected Workshop w/Bench Wired for Electric, 8' X 30' Arizona Room w/Tile Floor and Finished Storage Room, Front Covered Patio, Low Upkeep Landscaping and Front Covered Patio. Convenient Walk-Through Kitchen w/Breakfast Bar, Separate Laundry Room (Carport Access), Built-in China Hutch, Pantry, MBR Walk-in Closet, Walk-in Shower (MBA) and Tub/Shower Combination in 2nd BA. Includes all Updated (Newly Replaced) Appliances; Full Size Maytag Washer/Dryer, Smooth Top 30” Range, FF/DD Refrigerator and Dishwasher. OTHER: Low Upkeep Landscaping, Ceiling Fans T/O, Double In-Line Covered Carport, Faces East for Morning Sun with an Amazing View of the Superstition Mountains. 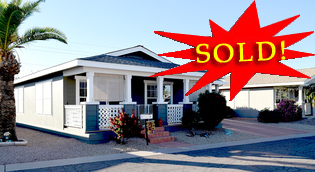 UPGRADES/OPTIONS: (Completed Phase 3) Resting Less than a Block Away from State-of-the Art Cabana-Pool-Fitness Facility. All Electric w/3 Ton Central AC & Heat Pump, 30 Gallon Water Heater, Tape & Textured Walls w/Bull Nosed Corners, Shingled Roof, Dual Pane Windows, Custom Enclosed Cemented front Patio w/Iron Railing, Doggy Door from MBR to Rear Enclosed Dog Run w/ Night Lights. Low Upkeep Landscaping, Sunscreens Plus a Matching/Connected “Tuff Shed” Storage Shed/Workshop (Wired for Electric). FEATURES/BENEFITS: Island Kitchen with 42” Walnut Cabinetry w/Raised Panel Doors & Adjustable Shelves, Decorator Counter-tops w/ Custom Backsplash, Deep Stainless Steel Sink w/S/L Faucet, Formal Eat-in Dining Area, and Kitchen Island. Generous Storage Throughout Including; Built-in Linen Cabinets, Laundry Room Cabinets, Free Standing Kitchen Pantry, and Storage in Laundry Room Plus, MBR Walk-in Closet and Sliding Wardrobe in 2nd Br. MBA Features Double Sinks, Private Commode & 2nd BA Offers Full Tub/Shower Combination. Includes all Frigidaire Stainless Steel Appliances; Refrigerator, 30” Smooth Top Range, Microwave, Dishwasher Plus a Front Load Washer & Dryer. OTHER: Superior CAVCO Construction and Craftsmanship, 2' X 4' Exterior Walls (16” Centers), 2' X 6' Floor Joists (16” Centers), 90” Sidewall Height, Solid Steel I-Beam Frame Construction, CEMPANEL Siding, Front & Rear Security Doors. UPGRADES/OPTIONS: (Phase 1) Located Just a Few Streets Away From Community Center/Pool. All Electric w/ Central AC & Heat (Heat Pump), Tape & Textured Walls, Custom Adjustable Cloth Blinds, Shingled Roof, Dual Pane Windows (Light Tint), 9' x 12' Composite Deck, Low Upkeep Landscaping, 9' x 12' Storage Shed, and Walk-in Closet w/ Cedar Shelving (Room Addition), Mirrored Wardrobe & Plumbed and Wired for Washer & Dryer in 2nd BA. FEATURES/BENEFITS: Gorgeous Cabinetry w/Raised Panel Doors & Adjustable Shelves, Formica Counter-tops w/ Tile Edging & Backsplash, Deep Stainless Steel Sink w/S/L Faucet and Pull Out Spray Feature, Lots of Storage Throughout Including Built-in Pantry, Built-in Linen Cabinets, Walk-in Closet, Exterior Storage Closet on Deck and 9' X 12' Storage Shed. Includes all Upgraded Appliances Including; Side-by-Side Whirlpool Refrigerator, 30” Smooth Top Range, Space Maker Microwave, and Dishwasher. Furniture AS-SEEN Including Lazy Boy Queen Sofa and Easy Chair Plus a Custom Built Office/Computer Center. FEATURES/BENEFITS: Located in Beautiful, Age Qualified, Gated Golf Resort Community in Mesa: Featuring Ground set Doublewides, Convenient Located within Minutes of more Golf, Shopping, Restaurants, Medical Facilities and Much More. Amenities Include; 9-Hole Pitch and Putt Par 3 Golf Course, Heated Pool, Whirlpool/Spa, Clubhouse, Exercise Room, Game Room, RV Storage, Friendly Neighbors Waiting for You! UPGRADES AND OPTIONS: This All Electric, Energy Efficient Home Features a 3.5 TON 14 SEER AC/HEAT - ($6000 VALUE), NEW INTERIOR AND EXTERIOR PAINT (2017), NEW LAMINATE FLOOR COVERING IN LR/DR ($3500 VALUE), NEW WATER HEATER (2017), NEW 2” FAUX WOOD BLINDS T/O, 30” SMOOTH TOP SELF CLEANING RANGE, DISHWASHER, SIDE BY SIDE REFRIGERATOR (WATER & ICE-MAKER). Also has UPDATED LAMINATE FLOOR COVERING in 2nd BR/OFFICE, CERAMIC TILE IN HIGH TRAFFIC & WET AREAS PLUS NEW CARPET IN 2ND AND MBR (2016). NEW KOHLER DUAL FLUSH COMMODES, NEW CEILING FAN (LR), NEW CONTEMPORARY CHANDELIER, NEW SMOKE DETECTORS PLUS A DRIP SYSTEM W/TIMER. POPULAR FEATURES: (3) Car Carport, Dramatic Cathedral Ceiling, Formal Dining Room, Tape & Textured Interior Walls w/Bull Nosed Corners, Natural Oak Type Raised Panel Cabinetry T/O, Raised Panel Interior Doors w/Lever Handles, Tiled Edged Formica Counter Tops, Ceiling Fans in LR/MBR. Dual Pane Garden Style Gridded Windows, Shingled Roof, Ample Counter & Space Plus a Bonus Area w/ Additional Counter-space & Storage at Entry to KIT. MBA offers Wide Vanity w/ Double Sinks, Soaking Tub, Walk-in Shower and Private Commode (2nd BA has Tub/Shower Combination). Tons of Storage T/O Including Built-in Linen Cabinets, Pantry Cabinets, Walk-in Closet (MBR), Sliding Wardrobe Closets in 2nd & 3rd Bedrooms and 8' X 10 Tuff Shed (Shingled Roof). OTHER: Custom Blocked Front Driveway, Cement Double In-line Carport with Partially Insulated Awning, “CEMPLANK” Siding, Front Composite Front Decking, and Asphalt Fiberglass Shingled Roof. Southern Front Exposure - Located Only One Block from Community Center, Exercise Room and Golf Course. Larger Pets Ok & Wonderful Neighbors! Includes TUNED UP “EZ GO” Golf Cart - Available Now! UPGRADES/OPTIONS: Located on Premium Corner Lot with Additional Build-Out Opportunity (Completed Phase 3) Resting Less than a Block Away from State-of-the Art Cabana-Pool-Fitness Facility. All Electric w/3 Ton Central AC & Heat Pump, 30 Gallon Water Heater, Tape & Textured Walls w/Bull Nosed Corners, Shingled Roof, Dual Pane Windows, Doorbell, Custom Enclosed Cemented front Patio w/Iron Railing and Retractable Front Sun Shade/Awning, Bougainvillea/Cacti Low Upkeep Landscaping, Epoxy Coated Driveway, Sunscreens and 8' X 8' Matching/Connected Storage Shed. FEATURES/BENEFITS: Front Kitchen with 42” Maple Cabinetry w/Raised Panel Doors & Adjustable Shelves, Decorator Counter-tops w/ Custom Tile Backsplash, Deep Stainless Steel Sink w/S/L Faucet, 18” Tile in (BA/Laundry & High Traffic Areas) and Formal Eat-in Dining Area. Generous Storage Throughout Including; Built-in Hall Pantry & Linen Cabinets, Additional Cabinets and OH Storage in Laundry Room Plus (2) Walk-in Closets w/Additional Overhead Shelving in Both Bedrooms. MBA Features Double Sinks, Sit-Down Shower and (3) Door Built-in Linen Cabinet, 2nd BA Features Full Tub/Shower Combination w/Adjustable Shower Head, Vent/Fan, Alcove Commode and Medicine Cabinet. Includes all Name Brand Appliances; Upgraded GE Side-by-Side Refrigerator, 30” Smooth Top Range, Space-maker Microwave, Dishwasher Plus a Full Size Washer & Dryer. OTHER: Superior CAVCO Construction and Craftsmanship, 2' X 4' Exterior Walls (16” Centers), 2' X 6' Floor Joists (16” Centers), 90” Sidewall Height, Solid Steel I-Beam Frame Construction, CEMPANEL Siding, Front & Rear Security Doors, Includes EZ GO Golf Cart, Custom Blocked Golf Cart Driveway, Amazing Views from Dawn to Dusk! PETS/REAR FENCING OKAY - PRICED TO SELL! UPGRADES AND OPTIONS: Spacious Ground set Doublewide on Desirable Interior Lot. Upgrades Include; UPDATED FURNACE (2014), UPDATED WATER HEATER (2016), UPDATED KITCHEN PAINT AND FLOOR COVERING (2007), BATHROOM TILE (2011), UPDATED EXTERIOR PAINT (2015). 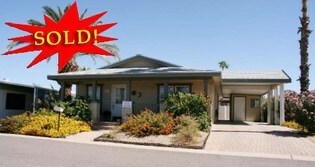 Also has Coated Front Patio and Carport Plus an Arizona Room w/Private Rear Access and Rear Covered Patio. Includes Name Brand Appliances; Kenmore Cook-top, Frigidaire Eye Level Range (2011), Signature Refrigerator, Kenmore Microwave, Estate Dishwasher, Garbage Disposal and Full Size Washer & Dryer. POPULAR FEATURES: Well Loved and Maintained Ground-set Home Offers Southern Front Exposure w/(3) Large Front Windows, Front Window Awning, Two Covered Patios, Arizona Room and Matching/Connected Storage Shed. Lots of Space Including Two Separate Living Areas, Walk Through Kitchen, Formal Dining Room, Spacious Master and 2nd Bedroom, Two Full Baths (One-pc. Tub/Shower Combination w/Simulated Marble Extended Vanities w/Base Drawers and High Rise Commodes). Lots of Storage Throughout Including China Hutch w/Base and Overhead Cabinets, Built-in Linen Cabinets, OH Storage in Laundry Area, Two Walk-in Closets (Both Bedrooms) and Storage Shed. OTHER: Easy Upkeep Landscaping, Transferrable Termite Warranty, Mostly Furnished Including; Two Sofa Sleepers (Double & Queen), Sectional, Recliner & Casual Chair, Coffee Table, Lamps, Dinette w/(2) leafs & (4) Chairs, MBR Furniture and 2nd Bedroom Furniture (Queen and Double Beds). UPGRADES AND OPTIONS: Updated AC & Heating Coil ($4000 Value - 2013), NEW Water Heater (2015- $700 Value), New Exterior Paint (2017) and Interior Accent Walls (2013 - $2500 Value), Dual Pane Garden Style Gridded Windows, Floor Covering (Salt & Pepper Plus & Vinyl), Ceiling Fans with Lights Throughout, Updated Counter-tops/Sink, Faux Wood Blinds, Free Standing “TUFF SHED” ($2500 Value). Includes All Updated Appliances; GE Dishwasher (2017), Side-by-Side DD/FF Refrigerator w/Water & Ice, 30” Gas Range, Microwave and Full Size Whirlpool Washer & Dryer (Except Additional Fridge in Laundry Room). POPULAR FEATURES: Other Deluxe Features Include Tape & Textured Interior Walls, Light Oak Type Raised Panel Cabinetry T/O, Walk-through 2nd BA (Tub/Shower Combination), Separate Laundry Room, Huge Workshop w/Front and Rear Access (Includes “Craftsman” workbench). Tons of Storage T/O Including Walk-in KIT Pantry, MBA Built-in Linen Cabinets and Linen Closet (Double Seat Walk-in Shower), Extended Vanity w/Base Drawers, MBR Walk-in Closet Plus OH Storage in Laundry Room. 3rd Bedroom Doubles as Office w/Modest Closet and French Door Entry. OTHER: Light & Bright Island Kitchen, Formal DR, Skylights w/Screens in KIT/BA, Shingled Roof and Front Covered Patio w/Golf Course View! UPGRADES AND OPTIONS: This All Electric, Energy Efficient Home Features Central AC and Heat, Dual Pane Garden Style Gridded Windows, Contemporary Window Valances, High Flat Ceiling & Ceiling Fans with Lights. Light and Bright Large Front Kitchen Offers Recessed Spot Lighting, Ample Counter Space and Storage Including (3) Door Pantry Cabinet with Access to Separate Laundry Room. Formal Entry Opens to Formal DR and Huge Great Room with Double Kitchen Entry. POPULAR FEATURES: Other Deluxe Features Include Tape & Textured Interior Walls w/Bull Nosed Corners, Maple Type Raised Panel Cabinetry T/O, Faux Wood Blinds, Plush Carpet and Ceramic Tile, Tiled Edged Formica Counter Tops. Fully Furnished Plus Includes All Name Brand Appliances; Side-by -Side Frost Free Refrigerator with Water (Ice-maker doesn't work), Smooth Top Range & Dishwasher and Microwave. MBA has Separate Double Sinks, Garden Tub, Separate Enclosed Shower and Large (3) Door Built-in Linen Cabinet, 2nd BA has Tub/Shower Combination. MBR Offers Private Exit to Rear Patio Area, Double Wall Length Wardrobe Closets with Raised Panel Sliding Doors. OTHER: Custom Blocked Front Driveway, Cement Double In-line Carport with Partially Insulated Awning, Front Composite Decking & Shingled Roof. Popular Perimeter Location Offers Rear Block Patio w/Access from MBR. Furnished AS-Seen Except Seller's Personal Items, Some Wall Hangings, and Flat Screen TV in Bedroom. Friendly Neighbors, Close to Golf Course/Community Center, Large/Multiple Pets Okay. UPGRADES/OPTIONS: Laminate Floor Covering Throughout ($7000 Value), Front Privacy Fencing ($500 Value), Window Awnings ($600 Value), Concrete Coating ($600 Value/2015), Replaced Oak Floor Molding ($400 Value), Updated Light Fixtures ($300 Value), Shed Rewire ($300 Value). Spacious Living Room, Cathedral Ceiling, Open Island Kitchen and Formal Dining Area. Also has 8' x 10' Matching/Connected Workshop with Shelving, Bench, Extra Refrigerator and Some Tools. FEATURES/BENEFITS: Includes All Appliances: DD/FF Whirlpool Refrigerator (Ice Maker Ready), 30 GE Electric Range, Hotpoint Full Size Washer and Dryer, Hotpoint Dishwasher, Microwave ($500 Value/2013) and “Maytag” Washer & Dryer. Energy Efficient, Double Paned Windows, Ceiling Fans, Shingled Roof, Sunscreens and Window Awnings. OTHER: Close to Clubhouse, Friendly Neighbors, LARGER/MULTIPLE PETS OK! UPGRADES AND OPTIONS: Spacious Ground set Doublewide Features Updated and Remodeled Kitchen and BA. Kitchen has New Counter-tops and White Laminate Cabinetry w/Pull Out Drawers, Updated Counter-tops and Deep Black Sink w/Single Lever Faucet & Garbage Disposal. Includes Updated Name Brand Appliances; 30” Smooth Top Range, Whirlpool (Base Freezer French Door) Refrigerator (2010), Maytag Dishwasher (2003), Whirlpool Space-maker Microwave and Kenmore Full Size Washer & Dryer. Other Upgrades Include Copper Plumbing, Updated Water Heater (2012) and Newly Installed Trane AC and Gas Furnace (2013) Plus an Evaporative Cooler. Remodeled 2nd BA Features Once Pc. Walk-in Shower w/Overhead Lighting, High Rise Commode (In Both Bathrooms), Vent Fan, Sheetrock Walls w/Extra Insulation, Reinforced Floors Plus a Convenient Compartment Door for Easy Access Water Shut Off or Plumbing Fixture Repair. POPULAR FEATURES: Front Formal DR and LR with Front Picture Windows, Built-in Buffet, Large Master BR w/Walk-in Closet and Generous MBA w/Double Sinks, Corner Sit-down Tub, Built-in Linen Closet. 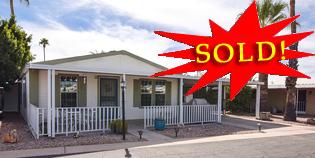 Arizona Room has Front and Rear Access w/Huge Rear Storage Room and Two Covered Patios. Covered Carport Accommodate Two Vehicles Plus a Golf Cart (which is Included). Matching and Connected Wired Workshop has Bench, Peg Boards and Shelving. Entry Door from Carport is Residential Inswing with Internal (Adjustable-Vertical) Blinds. OTHER: Massive Storage Throughout, Fruit Bearing Grapefruit and Orange Trees, Front Window Awning, Southern Front Exposure. Well Maintained by Same Owner for 16 Years. Quick Possession and Pets Okay! UPGRADES AND OPTIONS: Spacious Ground set Doublewide on Prime Corner Lot Available for Immediate Possession. Upgrades Include; Remodeled Kitchen w/Oak Cabinetry (Adjustable Shelves), Single Lever Sprayer Faucet and Water Filter System ($7000 Value), Laminate Floor Covering & Updated Interior Paint. Updated Central AC (2003) & Furnace, Gas Cooking and Water Heater. Includes All Appliances; GE 30" Range, Amana Refrigerator, Gold Star Microwave and Maytag Dishwasher and Full Size Washer & Dryer. Separate Laundry Room Boasts a Huge Sliding Wardrobe Closet w/Three Levels of Storage and Exits to Double In-Line Covered Carport with Matching/Connected Storage Shed. POPULAR FEATURES: Lots of Room for your Larger Furniture in the Huge 10' X 50' Arizona Room, Sprawling Front LR, Formal DR, Modest 2nd Bedroom and Gracious Master Bedroom w/Walk-in Closet. MBA Features Simulated Marble (Harvest Gold) Vanity w/Double Sinks, Built-in Linen Cabinets and Double Sit-down Shower w/Frosted Glass Enclosure (2nd BA has Updated Vanity and a Full Size Tub/Shower Combination). 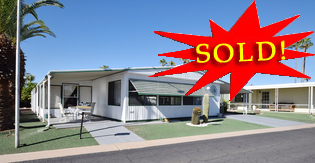 OTHER: Located Just a Couple of Community Blocks to Clubhouse, Southern Front Exposure (Front Window Awning), Huge Corner Lot w/Bougainvillea, Birds of Paradise and Gravel Landscaping. Furniture/Furnishings Negotiable. Even has Separate Uncovered Additional Parking in Rear. Includes Transferable Termite Warranty! UPGRADES/OPTIONS: CUSTOM IKEA REMODEL; GRANITE COUNTERTOPS/Breakfast Bar w/Base Cabinets, Massive Cabinetry w/PULL-OUT SLIDING DRAWERS, Quarter Wall Pantry, STAINLESS STEEL APPLIANCES Including Eye Level Range, Base Freezer Fridge, Dishwasher, Gas Cook-top w/Vent Hood, (2) Lazy Susan(s), Disposal and Deep Stainless Steel Sink w/SL Sprayer. OVER $29,000 IN UPDATES (Since 2013 Including): NEW PLUMBING, TAPE & TEXTURED WALLS, WOOD LAMINATE, CERAMIC TILE, NEW WATER HEATER, NEW GAS LINES, NEW EXTERIOR PAINT, LED DIRECTIONAL LIGHTING, REMODELED BATHROOMS (MBA- WALK-IN CUSTOM TILE SHOWER), MBA WALK-IN SHOWER, EASY UPKEEP LANDSCAPING, AC SERVICE CONTRACT. Also has Shingled Roof, Screened Patio w/NEW INDOOR/OUTDOOR CARPETING, TRIPLE IN-LINE CARPORT, MYERS LEMON AND ORANGE TREES, (2) MATCHING/CONNECTED STORAGE SHEDS PLUS A WATER SOFTENER! FEATURES/BENEFITS: Spacious Floor-plan offers Large Front LR/Center Family Room/Den, Huge Master Bedroom, Large 2nd BR (Jack-n-Jill 2nd BA), Tons of Storage Including MBR Mirrored Wardrobes, Built-in Resurfaced China Hutch & Coat Closet. Custom Kitty/Doggy Door to Screen Room, Covered Front Patio (Epoxy Coated) Cement and Re-Sealed Windows. OTHER: Southern Front Exposure, Tinted Picture Windows, Front Window Awning and Located Just ½ Block from 9 Hole Golf Course, Community Center w/Fitness Room, Heated Pool, Hot Tub, Library and Billiards. Pet Friendly Community - Available for Immediate Occupancy! 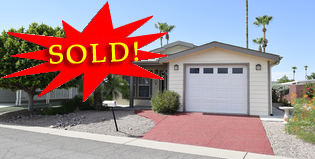 CAVCO DOUBLEWIDE IN GATED GOLF COMMUNITY! UPGRADES AND OPTIONS: Energy Efficient Home is All Electric w/Central AC/Heat, Dual Pane Windows, Ceiling Fans T/O, and Asphalt Fiberglass Shingle Roof with Recent Roof Sealant. Fully Furnished (See Inventory List), Newly Replaced Name Brand Appliances Including 30” Frigidaire Glass Top Range, Side by Side Refrigerator and Eye Level Microwave. Newer Exterior Paint (2012), New Floor Covering Replacement (2013), New Gutter and Standard Maintenance Re-Level (2014). FEATURES/BENEFITS: Large Front LR, Formal DR, Eat-in Kitchen (Access from Front Screened Room, Large Den, MBA with Extended Vanity, Built-in Linen Closet and Sit Down Shower, Separate Laundry Room w/Built-in Storage and Full Size Washer & Dryer (Access from Hall and Carport), Huge MBR with Mirrored Wardrobe, Storage Room Plus Separate Covered Area (For Motorcycle Parking), Shingled Roof with Recent Re-Seal and Available for Quick Possession. OTHER: Tape and Textured and Painted Wall Vinyl, Fully Furnished Including BR, LR, Den and KIT Furnishings (Some Exceptions - Get Inventory List for Full Detail). Faces West with a Delicious Lemon Tree! UPGRADES AND OPTIONS: Lots of Space in the Well Kept nearly 24' X 66' Ground Set Doublewide located on Pie Shaped Lot with Private Backyard. 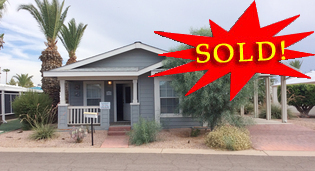 Includes All Appliance (Front Load Washer & Dryer - 2015) Large Wired Utility Workshop w/Workbench is Accessible from Arizona Room and Finished Craft Room Perfect to Use as Office, Walk-in Closet, Guest Area or Sewing/Craft Area. Light and Bright with Cheerful Interior Paint (NEWLY PAINTED CEILING KIT/FAMILY ROOM), Clean Exterior (Vinyl Siding), RECENT ROOF COAT (2015) and Ceiling Fans and Updated Central AC & Heat. POPULAR FEATURES: Huge Front LR with Coat Closet and Front DUAL PANE Picture Windows, Formal DR with Built-in China Display Cabinet, Center Kitchen (Laminate Floor Covering w/Breakfast Bar) and Family/TV Room. Light and Bright w/ Updated Appliances (Space-maker Microwave - 2016), Tons of Storage Throughout. Hall Exits to Carport w/ Built-in Computer/Office Area and Accesses 2nd BA with Additional Entry from 2nd BR. OTHER: Large MBR w/Sliding Wardrobe and Gracious MBA w/ Additional Sliding Wardrobe, Garden Tub, Separate Walk-in Shower, High Rise Commode and Extended Lavvy. Central A/C and Heat, Double In-Line Parking, Covered Patio and Large Side Blocked Sun Patio. Pet Friendly (Large and Multiple Pets Okay)! UPGRADES/OPTIONS: Light and Bright Interior with Front Picture Windows (UV Mirror Tint), Screen Room, Central AC & Furnace, Low Pile Berber, Tile and Linoleum T/O, Ceiling Fans T/O. Located on Prime Perimeter Lot w/Rear Cement Sun Patio, Double In-Line Carport with Aluminum Privacy Panels and Large Shed w/Full Size Washer & Dryer. POPULAR FEATURES: Large Front LR, Formal DR, Walk-Through Kitchen and Both Bedrooms Feature Walk-in Closets. Jack-n-Jill 2nd BA with Double Access has Handicapped Accessible Shower with Safety Grab Bar. Includes All Appliances, Sofa, End Tables, TV w/Stand, Large Wood and Glass Shelved Display Center and Some Patio Furniture. OTHER: Friendly Neighbors, Close to Clubhouse and Quick Possession. UPGRADES AND OPTIONS: This All Electric, Energy Efficient Home Features a NEW HEAT PUMP - ($6000 VALUE), NEW CARPET ($3500 VALUE), UPDATED 30” SMOOTH TOP RANGE, DISHWASHER, SIDE BY SIDE REFRIGERATOR (WATER AND NEW ICE-MAKER). 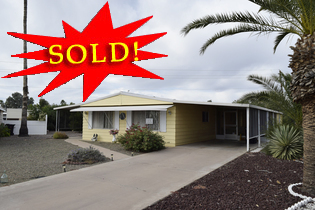 Also has UPDATED LAMINATE FLOOR COVERING in 2nd BR/OFFICE, Extended Carport and Wood Framed Shed w/Sub-floor. Available Fully Furnished (Inventory List Upon Request). POPULAR FEATURES: Dramatic Cathedral Ceiling, Formal Dining room, Tape & Textured Interior Walls w/Bull Nosed Corners, Natural Oak Type Raised Panel Cabinetry T/O, Raised Panel Interior Doors w/Lever Handles, Tiled Edged Formica Counter Tops and Ceiling Fans T/O. Also has Dual Pane Garden Style Gridded Windows, Tile in Wet Areas, Contemporary Window Valances, Ample Counter Space and Bonus Area w/ Additional Counter-space in KIT. MBA offers Separate Double Sinks, Garden Tub, Walk-in Shower and Private Commode. Tons of Storage T/O Including Built-in Linen Cabinets, Pantry Cabinets, Walk-in Closet (MBR) and Sliding Wardrobe Closets in 2nd & 3rd Bedrooms. UPGRADES AND OPTIONS: This Energy Efficient Home is All Electric w/ NEW Central AC UNIT ($5000 VALUE), NEW STORAGE SHED ($1500 VALUE) , Furnace, Dual Pane Garden Style Gridded Windows, Cathedral Ceiling, Ceiling Fans, Boxed Cloth Window Treatments, Faux Wood Blinds. Center Kitchen offers Ceramic Tile, Cherry Wood Photo Finish Raised Panel Cabinetry, Name Brand Appliances and Breakfast Bar. POPULAR FEATURES: TAPE AND TEXTURED WALLS, Formica Counter Tops w/Tile Edging, Raised Panel Cabinetry, Recessed Spot Lighting, Shingled Roof, Large MBR with Walk-in Closet, MBA with Double Sinks, Full Size Double Seat Shower w/Enclosure, and Linen Closets. Spacious Den w/French Door Entry Makes Perfect Office/Craft/Additional Guest Area. OTHER: Includes All Name Brand Appliances Including, 30” Smooth Top Electric Range, Dishwasher, DD/FF Refrigerator, Full Size Washer (New in 2011) and Dryer in Laundry/Utility Room with Convenient Carport Exit. Photos shown are prior to current owner and do not include furniture or furnishings as shown. CANADIANS SELLING - BE SURE TO WATCH THE VIDEO! UPGRADES/OPTIONS: NEW CENTRAL AC & FURNACE (2016), NEW WATER HEATER (2014), NEW DISHWASHER (2015), NEW 2ND BA HIGH RISE COMMODE, NEW GARBERATOR (2015), NEWLY INSTALLED VERTICAL BLINDS, NEWLY INSTALLED LAMINATE FLOOR COVERING, RECENT ROOF COAT (2014) PLUS NEW FAUCETS IN BOTH BATHROOMS AND KITCHEN. 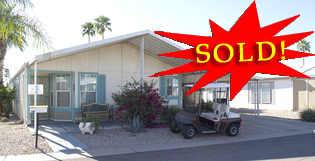 Enclosed Arizona Room - Access from Home & Exits to Private Rear Enclosed Patio Area - Additional Covered Patio (Behind Shed - Currently used for crafting), Storage Shed/Laundry Area w/Full Sized Washer & Dryer Plus Wash Basin and Double In-line Covered Carport. POPULAR FEATURES: Lots of Natural Light in LR with Three Large Front Picture Windows, Light Interior Spackled Walls, Spacious Walk Through Kitchen w/ Wrap-Around Breakfast Bar, Cooktop w/Base Sliding Shelves, Eye Level Range w/Warmer Oven, Built-in Pantry and Pull Out Shelves, Den/Office Area and Large Bedrooms, MBR Walk-in Closet w/Mirrored Wardrobe Doors, Ceiling Fan, Double Sink Vanity w/Base Drawers, Tub/Shower, Walk-in Shower in 2nd BA (Both w/Simulated Marble Lavvy) and Overhead Boxed Lighting Feature. Tons of Storage Throughout Including Built-in Book Shelf w/Base Cabinets, Built-in China Cabinet, (3) Pantry/Broom Closets, Built-in Linen Cabinet, Tri-Fold Medicine Cabinet, Built-in Desk (MBR), Coat Closet and More! OTHER: Available Furnished Including Sofa and Loveseat, Coffee & End Tables, Lamps, (2) King Beds, Beautiful Formal Dining Room Set w/Leaf and (6) Chairs, Desk and Chair, End Tables, Linens and Too Much More to List (Inventory Upon Request). Exterior Features Include; Low Upkeep Landscaping, Front Window Awning, Carport Privacy Sunscreens, Gutters and Two Orange Trees. Steps from Community Center and Golf! UPGRADES/OPTIONS: NEW AIR CONDITIONING UNIT AND FURNACE (2015), UPDATED Laminate Floor Covering, Carpet in both Bedrooms, Cork in KIT, Upgraded Vinyl in Laundry Room & Both BA's, Updated Interior Paint, Updated GRANITE KIT COUNTER TOPS, Tile Type Backsplash Facing and Coordinated Resurfaced Speckled Formica MBA Vanity, New Vanity in 2nd BA, Updated Light Fixtures and Shingled Roof (Sealed 2015). Light and Bright Contemporary Paint and Window Coverings, Spacious Living Room, Cathedral Ceiling, Ceiling Fans (LR/BR), Center Kitchen Alcove (Archway Entry to Formal Dining Area) and Separate Laundry Room. Exterior Features Front Covered Patio, Double In-Line Carport w/ Concrete Coating and Privacy Screens, Updated Interior Paint, Plus an 8' x 12' Matching/Connected Workshop with Shelving & Bench. FEATURES/BENEFITS: Tape and Textured Walls, Faux Wood Blinds, Walk-in Shower and Tub/Shower Combination w/Tile Accent, Separate Laundry Room w/Overhead Storage & Raised Panel Interior Doors w/Lever Handles. Also has Contemporary Sink Fixtures, Recessed KIT lighting w/New Soffits, Refaced Raised Panel Kitchen Cabinets. Ample Storage Throughout Including Kitchen Cabinets w/Pull Out Shelves, Double Sliding Wardrobe Closets, Built-in Linen Closet in MBA, Extended Vanity w/Base Drawers in MBA, Hall Pantry/Linen. Includes Updated Name Brand Appliances; Base Freezer French Door Refrigerator, Dishwasher and 30” Gas Range (All New in 2011), Plus Some Furniture and Furnishings Negotiable. OTHER: Close to Clubhouse, Friendly Neighbors, Easy Upkeep Landscaping! UPGRADES/OPTIONS: NEW CENTRAL AC UNIT (2015), LIGHT AND BRIGHT KITCHEN INCLUDES UPDATED APPLIANCES; WHIRLPOOL REFRIGERATOR (2013), GE DISHWASHER (2010) FRONT LOAD WASHER & DRYER, GARBAGE DISPOSAL AND 30” KENMORE RANGE. POPULAR FEATURES: Lots of Natural Light in LR with Three Large Front Picture Windows, Light Interior Walls. Front Entrance From Front Covered Patio to Large LR, Formal DR, Walk Through Kitchen and Room Addition/Office Area. Large 2nd and Master Bedroom w/Sliding Wardrobe Closets, Large MBA with Double Sinks, Tub & Shower and 2nd BA with Tub/Shower Combination. Double In-Line Carport with Privacy Screens, Separate Laundry Room w/Front Load Washer and Dryer and Shelving Double Access Plus another Storage Shed and Full Length Covered Patio. OTHER: Lemon, Orange and Grapefruit Trees. Laminate Floor Covering in Shed (Enough for New Flooring in Most of Home). OVER $11,700 IN RECENT IMPROVEMENTS! UPGRADES AND OPTIONS: This All Electric, Energy Efficient Home Features a NEW RHEEM PERFORMANCE HEAT PUMP (4 TON/14 SEER) - $6750 VALUE), NEW WATER HEATER ($875 VALUE), FRONT AND REAR SECURITY SCREENS, DELUXE SUNSCREENS, NEW PAINT (EXTERIOR & TRIM) AND UPGRADED IRRIGATION SYSTEM (OVER $11,700 IN RECENT IMPROVEMENTS! Also Features; Dual Pane Garden Style Gridded Windows, Berber and Tile T/O, Contemporary Window Valances, Faux Wood Blinds, Cathedral Ceiling, Ceiling Fans w/ Lights Plus a Custom Centralized Light Control Center. Light and Bright Large Front Kitchen Offers Recessed Spot Lighting, Ample Counter Space, and Name Brand (LG & Kitchen Aid) Stainless Steel Appliances Including Smooth Top Range w/Double Oven, Dishwasher, GE Microwave Plus a Deluxe Base Freezer French Door Refrigerator (NEW IN 2013). POPULAR FEATURES: Other Deluxe Features Include Tape & Textured Interior Walls w/Bull Nosed Corners, Natural Oak Type Raised Panel Cabinetry T/O, Faux Wood Blinds, Berber and Ceramic Tile, Tiled Edged Formica Counter Tops & Water Filtration. MBA has Separate Double Sinks, Garden Tub, Separate Enclosed Shower and Large (3) Door Built-in Linen Cabinet, 2nd BA has Tub/Shower Combination. MBR Offers Private Exit to Rear Patio Area, His /Her Wardrobe Closets with Raised Panel Sliding Doors. Kitchen Offers Archway Entry to LR, Convenient Access to Formal DR. Lots of Storage Including MBA Linen Closet, Hall Coat Closet Plus a (3) Door Pantry Cabinet in KIT & Interior Door Entry to Separate Laundry Room w/Overhead Storage. Huge Great Room Offers Plenty of Space for a Full LR Suite! OTHER: Custom Blocked Front Driveway, Cement Double In-line Carport with Partially Insulated Awning, Neutral “CEMPLANK” Siding, Sunscreens and Front Deck Roll Down Sunshades, Security Doors and an Asphalt Fiberglass Shingled Roof. Popular Perimeter Location Offers Privacy with a Fully Enclosed Rear Block Patio (Private Access from MBR) Extended Carport, and a Free Standing Wired 8' X 16' Utility Room with Separate AC Unit. Some Bedroom and LR Furniture Negotiable. Faces East for Morning Sun - Larger Pets Ok & Wonderful Neighbors! MASSIVE STORAGE THROUGHOUT - FACES EAST FOR MORNING SUN! UPGRADES AND OPTIONS: This Energy Efficient Home is All Electric with a NEW (2015) 4 Ton Heat Pump (Over 8 Years Left on Warranty-Parts/Labor/Compressor, FAFCO Solar Water Heater System, Dual Pane Garden Style Gridded Windows, Factory Installed Cloth Window Treatments, Cathedral Ceiling and Fans with Lights T/O. Amazing Kitchen w/Massive Pantry & Storage Cabinets w/Adjustable Shelves, Large Electric Island w/Base Drawers & Cabinets -Open to Formal Dining Room and Adjacent to Bonus Office Area and Separate Laundry Room. Popular Perimeter Location Offers Privacy Perfect for Future Enclosed Backyard (Upon Management Approval). POPULAR FEATURES: Tape & Textured Interior Walls w/Bull Nosed Corners, Tile Edged Formica Counter Tops, Raised Vanities in Both Bathrooms, Garden Tub/Shower in 2nd BA and Sit-Down Shower in MBA w/ Double Sinks Plus a Private Commode and Two Large Linen/Storage Closets. Upgraded Name Brand Appliances T/O Including Side by Side Refrigerator w/Water & Ice, 30” Smooth Top Range, Dishwasher, Extra DD Fridge in Bonus “Morning” Room and a Full Sized Washer & Dryer. Faces East for Morning Sun w/Front Porch, Custom Brick Walkway and Extended Drive, Covered Carport w/Cathedral Solar Panel Insulation, Double in-Line Parking, Covered Patio Area and a 10 X 12 Storage Shed w/Shelving. OTHER: Asphalt Fiberglass Shingled Roof, Raised Panel Cabinet Doors, Hardboard Siding, Watering System w/Timer. Mostly Furnished Including Some LR, DR, BR and Some Other Furnishings (Inventory List Upon Request). Split Floor Plan w/(2) Front Bedrooms and Huge Rear MBR Offering Privacy w/Guests. Hurry on this one!!! AVAILABLE FOR IMMEDIATE POSSESSION - ONLY $9,900! UPGRADES/OPTIONS: Light and Bright w/ Painted Interior Panel Walls, Convenient Kitchen w/White Kitchen Cabinets, Laundry Room w/Bi-Fold Doors, Screened Room and Workshop. This Cute Home Offers Central & Heat, Ceiling Fans, Vertical Blinds, Spacious Bedrooms Including MBR Walk-in Closet and a Walk in Shower in the MBA. Lots of Storage Throughout Including Broom Closet, Built-in China Hutch, Coat Closet, 2nd BR Sliding Wardrobe and Extended Vanities in Both Bathrooms w/Base Storage. POPULAR FEATURES: Includes All Appliances; DD/FF Refrigerator, 30” Gas Range and Full Sized Washer & Dryer. Front LR w/Lots of Windows, Window Awnings, Double In-Line Carport and Large Rear Yard (Perfect for Sun Patio or Pet Area). Close to Clubhouse, Southern Front Exposure and Available for Immediate Possession (Carpets Just Cleaned). OTHER: Large Matching and Connected Workshop, Friendly Neighbors, Furnished AS-SEEN! OPTIONS/UPGRADES: Tape & Textured and Vinyl Covered Drywall Throughout, Cathedral Ceiling, Shingled Roof (Sealed in 2014 w/5 Year Warranty), Updated Interior Two Toned Painted Walls, Raised Panel Light Oak Type Cabinetry, Updated High-rise Commode in 2nd BA (2012) Garden Style Dual Paned Windows, and Ceiling Fans T/O. Include Name Brand Appliances; Galaxy Side-by-Side FF Refrigerator, Whirlpool Washer & Dryer, Whirlpool Dishwasher (NEW 2015), 30” Magic Chef Range, Newer Vent Hood, Carousel Microwave, Garbage Disposal, Extra Refrigerator in Laundry Room and Reverse Osmosis. FEATURES/BENEFITS: Light and Bright Front Kitchen with Ample Storage and Counter-space, Eat-in Breakfast Nook and Archway Entries to Formal DR and Living Room. Lots of Storage Throughout Including Two Linen Closets, Walk-in Closets in 2nd BR and MBR, Pantry, OH Cabinets in Laundry Room and Matching Storage Shed. This Popular Floor Plan has a Huge LR, Den (Doors in Shed) and Two Large Bedrooms. 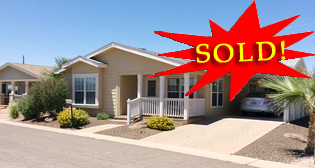 Faces East for Morning Sun w/Full Width Front Patio Awning, Formal Entry, Security Door and Double In-line Carport. OTHER: Fully Furnished (Excluding 2nd BR Set); Real Wood Formal DR Table w/Two Leafs and Six Padded High Back Chairs, Microfiber Sofa and Loveseat, Easy Chair & Ottoman, Chaise Lounge, MBR Queen Bed, Side Table and Dresser. Other Furnishings also Include TV/Stand, Most Wall Hangings, Lamps, Linens, Silverware, Dishes, Dishes, Coffee Maker, Toaster, Corning ware, Pots & Pans and Too Much More to List (Inventory List Upon Request). INCLUDES GOLF CART! UPGRADES/OPTIONS: Complete Remodel by (2) Canadian Couples now must Sacrifice Due to Canadian Dollar Exchange. Original (3) Bedroom Split Floor Plan was converted to Two Large Master Suites with (2) Private Bathrooms (Walk-in and His/Her Closets). Upgrades Include Laminate Floor Covering, NEW Window Coverings, NEW 52” Ceiling Fan (LR), NEW Entrance Doors (Including Security Doors), NEW Two Coat Interior & Exterior Paint, NEW Countertops and Cabinets (Pantry), Enlarged Entryways and Foyer, NEW Slider to NEW Arizona Room, NEW French Doors to Large Covered Patio with NEW Sunscreens, NEW Ceiling Fans and Light & Light Fixtures, NEW Vanity/Sink/Shower (South MBR), NEW Microwave Plus a Separate Laundry/Utility Room with Full Size Washer & Dryer, Countertops, Shelving and Large Sink with Hot/Cold Running Water. Other Improvements Include NEW Exterior Lighting, New Indoor/Outdoor Carpet on Patio, Additional Shed with NEW Paint and Shelving. FEATURES/BENEFITS: Prior Owners Spent Thousand in Other Upgrades (2007-2008) Including NEW PLUMBING ($3000 VALUE), Central AC, Shingled Roof, Stainless Steel DD/FF Refrigerator (Ice Maker, Stainless Steel DW, Maytag Washer & Dryer and Water Heater. Completely Furnished Including (2) NEW Leather Reclining Loveseats, (2) NEW Leather-Look-Alike Microfiber Reclining Loveseats and Chairs, NEW 55” LED Flat Screen TV (Negotiable), NEW DR Table with (4) Matching Leather-look-a-like Microfiber Chairs and Leather Reclining Love-seats, NEW King Bed Mattress with Headboard/Foot Board, Side Tables, Lamps, NEW Wicker Table & Chairs (Arizona Room), Patio Furniture, BBQ, and NEW Kitchen Bar Stools. Also Includes; Utensils, Glassware, Cutlery, Pots & Pans, Countertop Appliances (Blender, Juicer, Toaster & Keurig Coffee Maker) & Electric Popcorn Popper! OTHER: Private Pie Lot and Prime Perimeter Location w/Temporary Rear Dog Run and Irrigated Orange, Lemon and Plumb Trees. Multiple/Larger Pets Ok! UPGRADES/OPTIONS: REMODELED AND UPDATED WITH OVER $11,000 IN IMPROVEMENTS. These Include: LR/DR Double Paned Windows & Tinting ($2200 VALUE), Mostly Replaced PVC Plumbing ($2200 Value), NEWER (2013) Gas Water Heater ($400 VALUE), Ceiling Fans ($450 VALUE), Light Oak Laminate Flooring in LR/DR/DEN/2nd BA ($2000 VALUE), “Jacuzzi” Heated Walk-in Tub in MBA ($4000 Value), Entry Door w/Built-in Blinds ($300 Value), Track Lighting in Family Room & KIT area, Newer Interior Two Toned Paint, Rubberized Roof, Automatic Irrigation System ($250 Value), Central A/C & Gas Furnace. Nearly Full Length Arizona Room w/ Private Rear Office/Craft Shop, Gigantic Wired Workshop w/Bench & Shelving, Double In-Line Carport w/Privacy Screens plus a Front Covered & Carpeted Patio. FEATURES/BENEFITS: FULLY FURNISHED Including: Large MBR w/King Size Bed, (2) Night Stands, Armoire, (9) Drawer Dresser and Large Walk-in Closet. Also has Large 2nd BR w/Private Walk-Through BA, Walk-in Closet, Two Twin Beds with Newer Mattresses, Night Stand & Chest. Formal DR has Built-in Buffet/China Cabinet w/OH and Base Drawers and Includes Deluxe Oak Table w/Padded Chairs w/Rollers. Large Front LR is Light and Bright & Includes Huge SW Sectional, Coffee Table, End Table and Coordinating SW Lamp. OTHER: Kitchen has Open Access Center Kitchen Opens to Family/TV Room w/Breakfast Bar & Offers Three Ample Pantry Closets/Cabinets and Includes NAME BRAND APPLIANCES: 30” Gas Range, DD FF Fridge and DW. Also has NEW West Side Solar Screens ($290 VALUE). REDUCED TO SELL - ONLY $13,900 OBO! THE HIGHLANDS AT BRENTWOOD - IMMEDIATE POSSESSION! UPGRADES/OPTIONS: NEW (2014) Deluxe Stainless Steel LG Appliances Including: 30” Self Cleaning Smooth Top Range, (3) Rack Dishwasher, Side By Side Refrigerator w/Built-in Ice Maker and Large Pull-out Base Freezer Plus GE Profile Microwave ($5000 VALUE). Also has Professionally Installed Commercial Grade Plank Flooring in KIT & Den, High Rise Commodes, Updated White Cabinetry in KIT, Recently Installed Heavy Duty Roof Coat and Newly Screened Patio Room with Indoor/Outdoor Carpet (Front and Rear Access). POPULAR FEATURES: Large Front LR w/ Three Large Front Picture Windows, Light and Bright Walk-through Kitchen w/White Cabinetry, Built-in Breakfast Bar, Formal DR and Separate Den/Office Area w/Built-in Computer Desk and Additional Office Area w/Custom Storage Cabinets. MBR Feel to 2nd BR w/ Private Access to 2nd Jack-n-Jill BA w/Extended Simulated Marble Lavvy w/Base Drawers and One-Piece Tub & Shower Combination (MBA has Corner Garden Tub, Extended Vanity and Separate Dressing Area. Tons of Storage Including Triple Wardrobe Closets Plus Walk-in Closet in MBR, Wardrobe Closets w/Built-in Drawers in 2nd BR, Coat Closet, Built-in Linen Cabinets in Both Bathrooms and Built-in Storage in Separate Laundry Room (WD Hookups). OTHER: Huge MBR w/Private Sliding and Pet Doors to Screen Room, Recently Serviced HVAC, Storage/Utility/Workshop w/Sliding Glass Door and Wall A/C, Large Carport w/Privacy Panels, Central AC, Gas Furnace and Water Heater. Includes Swing Set! THE HIGHLANDS AT BRENTWOOD - THOUSANDS IN UPGRADES! UPGRADES/OPTIONS: THOUSANDS in Upgrades INCL; NEWER CENTRAL AC/HEAT UNIT, Gas Furnace, WHITE FRAMED DUAL PANE WINDOWS, UPDATED PLUMBING, ROMODELED KITCHEN (NEW COUNTERTOPS, UPDATED NAME BRAND APPLIANCES INCL; DD/FF Refrigerator, (5) Five Burner Gas Cooktop, Eye Level Range and DW. Also has UPGRADED DELUXE PLUSH CARPET AND CERAMIC LOOK VINYL FLOOR COVERING, VERTICAL BLINDS, and UPDATED INTERIOR AND EXTERIOR PAINT. Also has NEW COUTERTOPS, NEW SINKS AND FIXTURES (BOTH BATHROOMS) AND NEWLY REPLACED COMMODES. POPULAR FEATURES: Huge Front Great Room, Formal Dining Room, Den Area Perfect for Office, Built-in Buffet/China Hutch. Lots of Storage Including Double Wardrobes in MBR, Walk Through 2nd BA to 2nd BR, Walk Through Laundry Room with Full Size Washer & Dryer. Double In-Line Carport, Covered Patio, Storage Shed, Golf Cart Parking and a Fruit Tree! OTHER: Close to Community Center, Easy Upkeep Landscaping, Quick Possession, Room for Fence! GREET THE MORNING SUN ON YOUR OWN EAST FACING DECK! UPGRADES AND OPTIONS: This Energy Efficient Home is All Electric Heat Pump, Dual Pane Garden Style Gridded Windows, Deluxe Cloth Adjustable Window Coverings, Cloth Boxed Window Treatments, Cathedral Ceiling and Fans with Lights. Amazing Kitchen Offers Recessed Spot Lighting, Ample Counter Space & Massive Storage Including Large Pantry Closet with Top to Bottom Shelving and Handy Built-in Multi-rack Lazy Susan. Formal Entry Opens to Spacious LR & Formal DR with Streaming Natural Light. Popular Perimeter Location Offers Privacy with a Fully Enclosed Rear Block Patio w/Access from MBR and a Wired 10' X 14' Utility Room/Golf Cart Garage. POPULAR FEATURES: Other Bonuses Include Tape & Textured Interior Walls w/Bull Nosed Corners , Tile Edged Formica Counter Tops, Upgraded Name Brand Appliances T/O, Double Sinks in MBA Plus a Sit-down Glass Enclosed Shower and Double Linen Closets. This Gorgeous Home also offers an Abundance of Storage (2) Walk-in Closets and Large Slider in 3rd BR. Laundry Room is Easy Access to Kitchen and Walk-Through 2nd BA with a Tub/Shower Combination. Also Features Upgraded Tile and Laminate Floor Covering in KIT/DR/LR/BA and Deluxe Carpet in BR Areas. OTHER: Large 8' X 15' Utility Room, Custom Blocked Front Driveway, Cement Double In-line Carport, Neutral “CEMPLANK” Siding, Custom White Sun Screens, Security Doors on All Entries, Asphalt Fiberglass Shingled Roof & Bubbler Watering System w/Timer. Price also Includes Full Size Washer & Dryer, New LG Stainless Steel DD/FF Refrigerator, DW, Space maker Microwave and Smooth Top Self Cleaning Range. UPGRADES/OPTIONS: Well Loved Home (same owners for over 25 Years) has THOUSANDS in Upgrades INCL; NEWER CENTRAL AC/HEAT UNIT (2009), DOUBLE- PANE WINDOWS, COPPER PLUMBING, ROMODELED KITCHEN (NEW COUNTERTOPS, RAISED PANEL NATURAL OAK-TYPE CABINETRY AND NAME BRAND APPLIANCES INCL; Whirlpool Refrigerator & Range, GE Dishwasher (2015), GARBAGE DISPOSAL (GARORATOR) and DELUXE BOCHE FRONT LOAD WASHER & DRYER. Also has UPGRADED DELUXE PLUSH CARPET AND CERAMIC LOOK VINYL FLOOR COVERING, VERTICAL BLINDS, UPDATED INTERIOR WALL PAPER, AZ ROOM HAS SEPARATE OFFICE & BAR WITH SINK. Exterior Features Include Fully Stocked Workshop w/ Window AC, Professionally Installed Decorative Concrete Coating Plus Sunscreens. POPULAR FEATURES: Lots of Natural Light in LR with Three Large Front Picture Windows, Formal Entrance From AZ Room, Large Bedrooms, MBR with Walk-in Closet and Private BA w/ Extended Vanity and Enclosed Commode and Shower, 2nd BA w/Shower (Both with High-rise Commodes). This Home Offers Ample Storage Throughout Including Pantry/Linen and Coat Closets, OH Storage in Laundry Room and 2nd BR Sliding Wardrobe Closet. Ground set with Great Curb Appeal Featuring Peaked Front Gable, Aluminum Carport Privacy Panels and Attractive Vinyl Siding. OTHER: Friendly Neighbors, Naval Orange Tree and Extra Insulated Fridge in Shed! UPGRADES AND OPTIONS: Includes Thousands in Name Brand Furniture, NEWLY UPDATED PLUMBING, NEWER WATER HEATER, NEW LINOLEUM IN BA, NEW MATTRESSES, Large Screen Room Plus Front Covered Patio, Plus a Wired Workshop with Full Size Washer & Dryer, Bench and Shelving. Also has Sun Blocking Roll Down Shades, Sunscreens and Neutral Vinyl Siding, Easy Upkeep Landscaping with Updated Bubble System. FEATURES/BENEFITS: This Home Offers a Large Front LR, Formal DR, Walk-Through Eat-in Kitchen w/Vinyl Floor Covering, Huge MBR, One Piece Tub/Shower and Walk-in Shower in MBA and 2nd BA and Lots of Windows for Natural Light. This Super Clean Home Offers, Tons of Storage Including Built-in Cabinetry, Built-in China Hutch/Buffet, Wardrobes w/Sliding Doors, BA Vanity Base Drawers, and a Built-in Linen Closet in MBA. OTHER: Drive-up Curbside Mailbox and Just Half a Block from the Community Golf Course! BEAUTIFUL PALM HARBOR HOME WITH GARAGE! SEE A VIDEO FOR THIS PROPERTY! Located in Beautiful, Age Qualified, Gated Golf Resort Community in Mesa: Featuring Ground set Doublewides, Convenient Located within Minutes of more Golf, Shopping, Restaurants, Medical Facilities and Much More. Amenities Include; 9-Hole Pitch and Putt Par 3 Golf Course, Heated Pool, Whirlpool/Spa, Clubhouse, Exercise Room, Game Room, RV Storage, Friendly Neighbors Waiting for You! UPGRADES AND OPTIONS: This Energy Efficient Home is All Electric w/Central AC/Heat and has Dual Pane Garden Style Gridded Windows, Cathedral Ceiling & Ceiling Fans Throughout. Large Center U-Shaped Kitchen Offside Buffet with Base and Overhead Storage and Breakfast Bar. Gigantic Front LR (New Carpet), Separate Laundry Room with Storage Cabinets and Single Car Garage and Kinetico Water Softener! POPULAR FEATURES: Tape and Textured Walls w/Bull Nosed Corners Throughout, Tile Edged Formica Counter Tops & Raised Panel Cabinetry, Recessed Spot Lighting, Shingled Roof, Newer Heat Pump (2014) and Newer Water Heater (2013). Stunning Combination of Rich Wood Type Cabinetry, Light Interior Walls and Tasteful Window Coverings. Huge MBR and MBA with Double Sinks, Full Size Double Seat Shower w/Enclosure, Walk-in and Linen Closets Plus a Private Rear Exit to Small Blocked Patio. OTHER: Includes All Name Brand Appliances Including, 30” Smooth Top Electric Range, Dishwasher, Side by Side Refrigerator, Full Size Washer and Dryer Plus a Freezer in Laundry/Utility Room. Friendly Neighbors, Close to Pool and Golf Course, Ready for Immediate Occupancy! STEPS TO COMMUNITY GOLF AND POOL! UPGRADES AND OPTIONS: This Energy Efficient Home is All Electric w/Central AC/Heat with Dual Pane Garden Style Gridded Windows, Cathedral Ceiling & Deluxe Ceiling Fans with Lights Throughout. Convenient Center Kitchen offers a Breakfast Bar, Tile Edged Formica Counter Tops, Tons of Storage and Includes Upgraded Name Brand Kenmore and GE Appliances; Smooth Top Range, DD/FF Refrigerator, Full Size Washer & Dryer and Eye Level Microwave. Thousands in Upgrades Including Laminate and Ceramic Tile Throughout ($8600 VALUE), Real Wood Blinds ($3000 VALUE), Custom Window Sills, Large Rear Screen Room with Tex Deck Platform from MBR Slider-Rear Exit, Extended Durable Front Tex Deck with Custom Banisters, Base Crown-Molding Baseboards Plus a Large Under Cover “Tough Shed”. POPULAR FEATURES: Tape and Textured Walls w/Bull Nosed Corners Throughout, Large Bedrooms Including a Huge MBR with Walk-in Closet (OH Lighting) and MBA with Sit -down Shower, Built-in Linen Cabinets & a Double Lavvy w/SL Faucets. Master Bedroom Retreat offers Private Access to Large Rear Screen Room with Carport and Rear Access Outside Entrance. 2nd BR Features 9' Raised Panel Sliding Door Wardrobe and a Beautiful Custom Wall Mounted Book Shelf. OTHER: Deep Sink w/SL Faucet, Disposal, Raised Panel Cabinetry T/O, Adjacent-to-KIT Laundry Room with Huge Triple Cabinet Pantry, Custom Mirrored Key/Mail Cabinet, Carport Exit and 2nd Walk-Thru BA. Spacious Formal DR, Open LR Invites Streams of Natural Light Featuring Four Large Picture Windows w/Custom Fabric Window Treatments all contribute to this Home's Elegant Feel. Custom Blocked Front Driveway, Shingled Roof, Extended Front Porch and Water System with Timer. UPGRADES AND OPTIONS: Laminate and Deluxe Plush (Tight knit) Carpet Throughout, New Oak Cabinets (Vanity/Lavvy) in MBR, Walk In Closet, Mirrored Closet, Walk-Through Bath Access from Hall and 2nd BR, Den/Office Area, Upgraded Ceiling Fans w/Lights, Tape & Textured LR/HALL AND KITCHEN WALLS, Feature Recessed Spot Lighting in Kitchen, Stainless Steel Appliances (Profile Arctica Side by Side Fridge w/Water and Ice, Maytag DW and Glass Top Range/Double Oven). Also has Formal DR w/Built-in Buffet (Glass Shelves), Vertical Blinds Throughout and New Dual Pane Windows. OTHER FEATURES: Copper Plumbing, New Speckled Formica Counter Tops w/Rounded Edges (Looks Like Granite), Deep Stainless Steel Sink w/SL Faucet Huge 16' X 23' LR, 16' X 16' MBR w/Easy Entry to Dressing Room, Separate BA w/Shower and New High Rise "Kohler" Toilet and Solar Tube Lighting (Natural Light in MBA), Spanish Style w/ Contemporary Fiesta Bowl Lavy and Solo SL Faucet, Laundry Area w/Feature Lighting, Double In-Line Covered Parking, Huge Double Door Workshop, Gigantic Fenced Yard plus a Fully Covered Patio! OTHER: NEW PLUMBING, LAMINATE AND UPGRADED CARPET/PAD THROUGHOUT! 92 YEAR OLD WOMAN NEEDS TO SELL! FEATURES/BENEFITS: This Home Offers a Large Front LR, Formal DR, Walk-Through Kitchen w/Vinyl Floor Covering, Good Size BR's, MBA w/Double Simulated Marble Sinks, Built-in Linen and Corner (Standard Size) Garden Tub/Shower Combination, 2nd BR w/Full Size Tub/Shower Combination and Eat-in KIT Nook. Lots of Storage Including Built-in China Hutch LR Sliding Wardrobe Closets, Hall Coat Closet, and More. OTHER: Friendly Neighbors, Definitely Needs Cleaning/Updates/Fix Up's and Seller was a Smoker. UPGRADES AND OPTIONS: Spacious Home Offers Three Large Bedroom and Two Remodled Baths w/ Walk-in Showers (Safety Grab Bars), Screened Patio and Large Double In-Line Covered Carport with Privacy Panels. MBR Offers Walk-in Closet and Private Rear Exit/Entry. Light and Bright Walk-Through Kitchen has White Cabinetry & Offers Upgraded Frigidaire Appliances Including a 30” Smooth Top Range, Dishwasher, DD/FF Refrigerator and Stacked Washer & Dryer. FEATURES/BENEFITS: Newer Heat Pump, Laminate Flooring in KIT/Family Room/Hall/2nd & 3rd BR, Updated Plumbing Fixtures, Vertical Blinds and Ceiling Fans with Lights. Lots of Storage Including Built-in Buffet in DR, Built-in Linen in Hall and BA, Toiletry Cabinets, Walk-in and Sliding Wardrobes and a Good Sized Storage Shed. 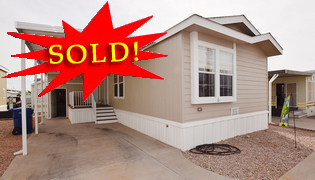 Well Maintained with Metal Siding and Coated Metal Roof and also offers a Front Window Awning. OTHER: Ready for Immediate Possession & Close to Community Center. Pets Ok! !!! DROPPED BY $23,000.00 !!! CLOSE TO COMMUNITY GOLF AND POOL! UPGRADES AND OPTIONS: This Energy Efficient Home is All Electric w/Central AC/Heat and has Dual Pane Garden Style Gridded Windows, Cathedral Ceiling & Ceiling Fans Throughout. Kitchen is Large and Open w/Breakfast Bar, Tile Edged Formica Counter Tops, Upgraded Appliances, Large Ceramic Sink w/SL Faucet, Disposal & Reverse Osmosis, and Raised Panel Cabinetry is Adjacent Laundry Room w/Huge Triple Cabinet Pantry and Access to 2nd BA and Workshop. Front DR/LR are Light and Bright w/Four Large Picture Windows w/Custom Boxed Fabric Valances and Offers an Elegant Open Feel. POPULAR FEATURES: Tape and Textured Walls w/Bull Nosed Corners Throughout, NEW Faux Wood Blinds, Large Bedrooms Including a Huge MBR with Walk-in Closet (OH Lighting), Master Retreat w/Private Access to Rear Covered Cement Patio (Solar Panel Insulated Patio Cover w/Ceiling Fan) and 2nd BR w/Raised Panel Sliding Wardrobe Closet. ( 15' X 18' MBR, 12' X 15 Master Retreat and 12 X 15' 2nd BR). Master BA has Sit -down Shower, Built-in Linen Cabinets & a Double Lavvy w/SL Faucets! OTHER: Large 12' X 27 Wired Workshop (Could be Converted to Arizona Room), Custom Blocked Front Driveway, Yellow and White Vertical Lap, Shingled Roof, Front Porch and Front and Rear Bubbler Watering System. UPGRADES AND OPTIONS: This Energy Efficient Home is All Electric w/Central AC/Heat and has Dual Pane Garden Style Gridded Windows, Cathedral Ceiling & Ceiling Fans Throughout. Kitchen is Large and Open w/Breakfast Bar, Tile Edged Formica Counter Tops, Upgraded Name Brand Appliances, Large Ceramic Sink w/SL Faucet, “SINKERATOR” (New 2013) & Reverse Osmosis (New 2008). This Gorgeous Home Offers Natural Oak Type, Raised Panel Cabinetry Throughout, Tape And Textured Walls w/Bull Nosed Corners and Lots of Natural Streaming Light. 2nd BR has Convenient Access from Laundry Room (w/Overhead Storage) and Hall. Front DR/LR are Light and Bright w/Four Large Picture Windows w/Custom Boxed Fabric Valances and Offers an Elegant Open Feel. POPULAR FEATURES: Large Rooms Throughout Including a Huge MBR with Gigantic Walk-in Closet (OH Lighting), Master Retreat w/Private Access to Rear Covered Cement Patio and 2nd BR w/Raised Panel Sliding Wardrobe Closet. ( 15' X 18' MBR, 12' X 15 Master Retreat and 12 X 15' 2nd BR). Master BA has Sit -down Shower, Built-in Linen Cabinets & Extended Vanity! OTHER: Large 8' X 15' Utility Room, Custom Blocked Front Driveway, Neutral “CEMPLANK” Siding (25 Year Warranty), Shingled Roof, Front Porch and Front and Rear Bubbler Watering System w/Timer. Private Perimeter Location w/Amazing Neighbors Right Across the Street! AMAZING HUGE 1 BEDROOM 1.5 BA PALM HARBOR WAITS FOR YOU! UPGRADES AND OPTIONS: This Energy Efficient Home is All Electric w/Central AC/Heat and has Dual Pane Garden Style Gridded Windows, Cathedral Ceiling and Great Room Floor-plan w/ Open Front Kitchen (Speckled Formica Counters T/O w/Tile Edging & Backsplash, Ceramic Sink, SL Faucet & Disposal), Breakfast Bar & Formal DR. Includes Upgraded Appliances (Including NEW Deluxe Computerized Samsung Side by Side Fridge w/Water & Ice, 30” Electric GE Oven and Space maker Microwave). This Elegant Home also has Natural Color Raised Oak Type Cabinetry, Deluxe Carpet/Tile, Upgraded Lever Handle Doors and Tape & Textured Throughout. POPULAR FEATURES: Huge (15' X 18') Bedroom and Large Walk-in Closet Leads to Laundry Area w/ NEW Stack Washer and Dryer plus Ample Linen Storage. Bedroom Offers Private Exit/Entrance and Professionally Installed “Doggy Door” to Covered Patio, and Large Rear Sun Area. MBA has Double Sinks, Tiled Walk-in Shower, Built-in Linen and Skylight for Lots of Natural Lighting. OTHER: Convenient 2nd ½ BA for Guests, Ceiling Fan w/Light in LR, DR Chandelier, Double In-Line Parking w/Covered Carport and Custom Block Drive. Also Features 6' X 10' Front Railed Deck, Easy Upkeep Landscaping w/Irrigation System and Tuff Shed.